Secluded newer Lake home in a wilderness area. Minutes away from Rhinelander. You will enjoy privacy as this is the only home on the lake. Great fishing and lots of peace and quiet. A large wraparound deck overlooks the lake and Wilderness. There is also a deck that takes you down to the lake with landings for a closer view. 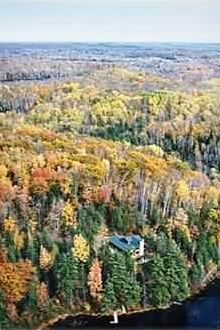 This tastefully furnished cabin has log exterior and pine board interior giving it a true northwoods appeal. The livingroom has 20 ft stone fireplace and comes with cable 65 inch TV and a DVD player. A kitchen with snack bar and separate dining/sunroom area are perfect for family gatherings. The upstairs Master bedroom has a king size bed and deck that overlooks the lake and woods. The Master Bath has whirlpool tub. A second bedroom also has a queen bed with down comforter. Bedroom three has a bunkbed with a single on top and double bottom. The downstairs walkout Great Room boasts a stone fireplace and a bar and lots of windows with a great view of the lake. We also have an attached 2 car garage for your use. Horse shoes, tetherball, hammocks, books, games, sandbox with toys, canoe, boat, paddle boat, kayaks, inner tubes, life jackets and some fishing poles, and firewood for the fire pit are included with the cabin. night all of us sitting around a camp fire. Sitting down by the water with the lake to ourselves. One of the things that really stood out was how quiet it was up there. With the fast pace and complicated schedules we all have this was a time we will not forget to be able to kick back and relax in such a great place. The kitchen had every thing we needed. The beds were very comfortable. We will always cherish the memories of our stay and look forward to coming back. Thanks to Kay and Bonnie working with both of you through our rental was a pleasure. The lake house is was perfect for our vacation. The only house on the lake. We spent hours every day floating and kayaking. Perfect. Absolutely exquisite!!! House in well kept condition, clean, fully stocked with cleaning supplies, pots/pans, high end appliances. Big garage to park in and store ATV/bikes. Access to ATV trails within a few miles (ATVs allowed on County B). Great place to get away from it all!!! We had an absolutely splendid vacation in this lovely cabin. We were blessed with beautiful weather, starry nights and the sparkling play of color as the woods transformed from gold-tinged green to a spectacular autumn quilt. Kay could not have been nicer to work with, and the house could not be nicer to stay! Every comfort and convenience with the perfect level of peace and solitude. We are grateful for the opportunity to share this lovely place. I would give the property six stars if I could. We will most certainly be back. Thanks Ken and Kris. We are so lucky to get great people to share our cabin. Couldn't be happier about our stay. There were 5 of us on a family reunion, and we found this cabin near where we did vacations as kids. The house was great - log cabin but with modern conveniences, comfortable accommodations, and great kitchen. Property was big, secluded and quiet, and the private lake was bigger than we expected - we used the rowboat to tool around. We even caught a decent sized largemouth from the pier (and released it for future tenants). Kay was very helpful and her directions were perfect (you'll probably need them as Google Maps took a different route). Thanks Kurt, I'm glad you had a good time. Also thanks for the tips!!!! We stayed here and were blown away from the beauty of the house and the outside. We arrived with plans to eat out for most of our meals but when we arrived we decided to stay in for all our meals and just ate out once for our 3 night weekend. It's off the beaten path but that's what makes it worthwhile especially on your own private lake. We had 7 people in our party and everyone was very comfortable! The only thing we wish was that the couch in the basement was a sleeper sofa but the sofa in the main living room was so comfortable we sat there most days just watching movies with the fireplace going. We went on a beautiful hike and explored a little. It was a little cold out so we came back in and warmed up. We played games around the big dining room table. The kitchen was so accommodating we had bountiful breakfasts and pizzas and lasagna and the counter was full of snacks. They've thought of everything and the owners were very easy to work with and sent our deposit back very fast. Thanks for letting us stay and we hope to come back again!